The redwoods, once seen, leave a mark or create a vision that stays with you always. No one has ever successfully painted or photographed a redwood tree. The feeling they produce is not transferable. From them comes silence and awe. It's not only their unbelievable stature, nor the color which seems to shift and vary under your eyes, no, they are not like any trees we know, they are ambassadors from another time. I took a walk in Armstrong Woods a while back. It was a perfect day and the redwoods didn't disappoint. Payton loves this walk... the rangers absolutely adore him, they give him treats on his way in and out, and they all know him by name...he gets a lot of pets from everyone he encounters. 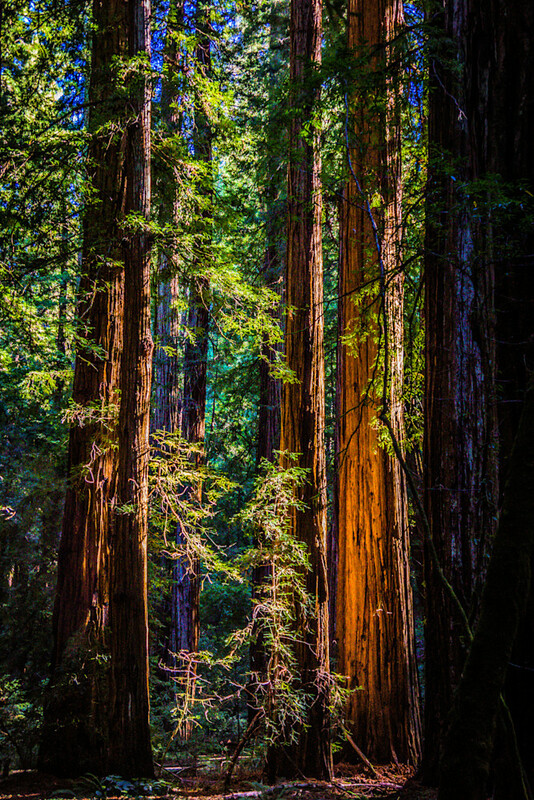 This redwoods walk always fills us with a sense of awe, their beauty is inspiring. As we were walking, I was overwhelmed with gratitude that I have the opportunity to spend time amongst these gentle giants whenever I want or feel the need. And the sunlight filtering through these trees created an elegant beauty that simply took my breath away.